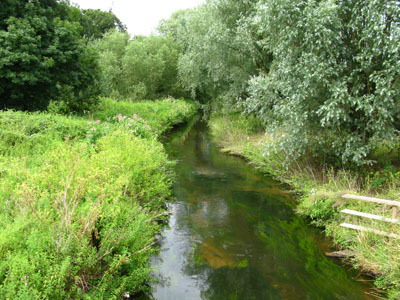 Situated within Walesby Forest Scout Camp North of Ollerton this venue offers members the chance to fish a small winding river. Ideally suited to the often forgotton art of trotting and requiring a minimal amount of tackle as searching out the fish often requires frequent moving. The upstream end closest to the bridge and down to the weir is the easiest section to access, below this some sections are just too shallow to fish, however at the bottom end of the stretch, behind the scout camp lake, there are some deeper holes that may hold better fish. Please note that access to the river can be very difficult due to vegetation in places behind the lake. The water may be used by members and visitors to the Scout Camp. No Night Fishing. Closed Season 15th March to 15th June Inclusive. Very strict rules apply at this venue regarding access. Before fishing you must report to the Scout Camp office (Tel: 01623 860202). From Ollerton Roundabout take the A614 North for 1 Mile. Turn right at the sign for Walesby, along this road is a humped back bridge, this is the start of the water (right bank looking downstream). Parking is available just inside the gate 120 Yards past the bridge on the left. Cars must not be taken down towards the river or be driven across the field at any time. N.A.A. key required. The Scout Camp office is a further ¼ mile on the left. At certain times you may be allowed vehicular access closer to the bottom end of the stretch. Ask at Office for details.